Greenwashing, literally “wash with the green”, is a phenomenon that indicates the communication strategy of certain businesses, organizations or institutions designed to build self-image false-positive from the environmental effects, in order to divert ‘ attention of the public from the adverse effects on the environment caused by its activities or its products. This phenomenon, growing today in advertising and marketing, is therefore unjustified appropriation of environmental virtue to create a green image. The cynical use of environmental issues, environmentalism, or used as a convenient slogan, creates several problems first among consumers but, secondly, it ends up turning against the same companies, even those that are really green. In fact, being raised consumer awareness in recent years to environmental issues, it is at the same time increased the feeling of condemnation to those who claims to be “green” without actually be. In a communication environment in which the prefixes eco, bio, green are present in many commercials and advertising campaigns, the higher the possibility that there are fake brands and labels. The greatest risk of this phenomenon grow with a general sense of distrust of the actions and green policies at a time when certain issues could do more easily in society breach. The reputation of a company attentive to environmental issues is constructed in an honest, transparent and ethical without making merely cosmetic and instrumental operations. Better not to communicate attitudes that do not coincide with reality because the attempt to appear environmentally friendly without being really condemned by the new consumer who does not reject the creativity, but pay attention to the substance and veracity of messages. The important thing is not to appear sustainable but make things sustainable and communicate. 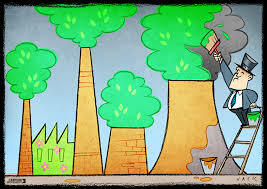 Greenwashing be countered because it ends up being an obstacle to the sustainable development of the economy.